Ensuring PCI compliance throughout your contact center and business when processing card payments is challenging. It can be virtually impossible to secure every system, from call recording through to agent activity, network security and data backups. 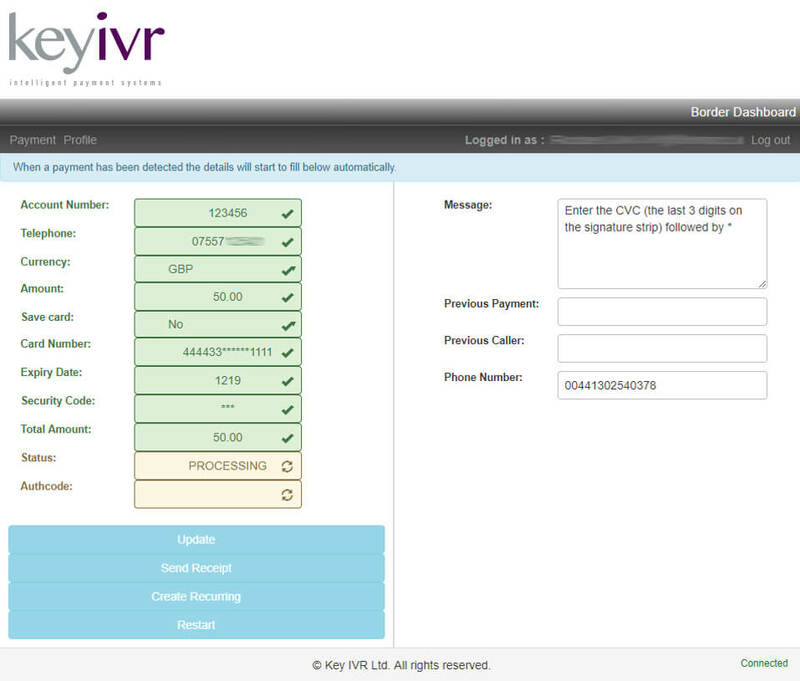 Key IVR’s Border platform for Call Center Card Payments is an intrinsic part of our payment suite, and is helping call centers reduce their costs of PCI Data Security Standard (PCI-DSS) compliance, even to the point of making a business compliant that would be impossible without the service. Calls entering your organization will be routed through the Border platform, suppressing the data DTMF to deliver Voice only. This ensures every call is PCI-DSS compliant so agents can process a payment securely and the call can be safely recorded. Call us on +1 (929) 207 0116 or email sales@keyivr.com and we'd be happy to discuss the options in more detail. Tokenize a customer's card and they will only have to provide card details once, saving them time on regular payments and purchases. Card details are not stored anywhere outside the issuing card company. All tokens will have a dedicated reference for every individual customer. E.g. Policy number, customer number, customer name, phone number, etc. Offer your customers a Recurring Payment Plan with a range of payment frequencies, such as weekly, fortnightly, monthly and more. If required, a Recurring Plan/CPA (Continuous Payment Authority) can be created by processing $1 that will not be taken on the customer's account. Using a Recurring Payment Plan instead of a Direct Debit allows you to re-take failed payments, restarting the plan and avoids your customers incurring expensive Failed Direct Debit charges. This method is recommended by the FCA, as debt isn't added onto customers paying off existing debt.